As discussed previously on New York Court Watcher, the Arizona Supreme Court's decisions are divided very infrequently. (See Arizona and New Mexico Supreme Courts: Contrast in the Southwest, August 6, 2008.) In the past five years, August 2003 through July 2008, only 29 of the court's decisions were not unanimous. Indeed, a more accurate number is even smaller. 11 of the total 29 divided decisions actually represent the same lone justice's same disagreement with the majority over the same issue. Usually in the same single dissenting paragraph. In each of those 11 cases, the now-retired Chief Justice Charles Jones dissented alone to insist that a Ring error required an automatic reversal, not the harmless error analysis engaged in by the majority. If those 11 nonunanimous decisions are treated as the single division they actually represent, then the total 29 divided decisions over the past five years is reduced to 19. Among these 19 divided decisions, 10 were criminal ones. GRAPH 1 indicates how each member of the court voted in the 10 divided criminal cases--i.e., how frequently siding with the prosecution and how frequently with the defendant. At first blush, it may well seem that little can be gleaned from only 10 decisions. The reality, however, is the opposite. Divided decisions from a court that is so overwhelmingly unanimous can be very revealing. These are the decisions in which members of the court felt so strongly about their differing positions that they were willing to break with the rarely broken custom of unanimity. These are the decisions in which the court's united front did not hold. The disagreements were too deeply felt. And in each of the resulting divisions, each member of the court had to choose which side to take in the publicly manifested disagreement. A few things are clear from the voting figures reflected in GRAPH 1. Significantly, the Arizona Supreme Court has been strongly pro-prosecution on the issues that divided the justices. 70% of the time in which the justices had a disagreement strong enough to result in a divided decision, the court adopted the position more favorable to the prosecution. Less than half as frequently, 30% of the time, did the majority of the court take the position more favorable to the accused. Additionally, there is an unmistakable ideological spectrum on the court. At one end of the spectrum is Chief Justice Ruth McGregor who took the pro-prosecution position in every one of the 10 divided cases. Her 100% pro-prosecution voting record contrasts most sharply with the 17% pro-prosecution record of Justice Andrew Hurwitz. He participated in only 6 of the 10 divided criminal decisions. But in those fewer decisions, he voted for the position more protective of the rights of the accused 5 times. She never did in the total 10 cases in which she participated. What does this mean? 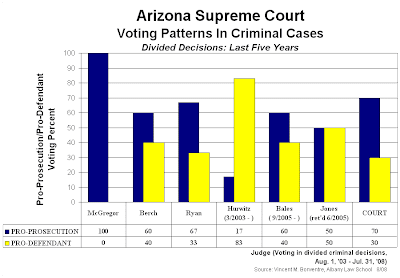 Among other things it means that in the 10 criminal decisions in which the Arizona Supreme was divided over the past five years, McGregor never authored a majority or dissenting opinion siding with the accused on an issue that divided the court. Nor did she ever join such a pro-defendant majority or dissenting opinion written by a colleague. Hurwitz's voting record contrasts most sharply with hers. But, in fact, none of her colleagues has a voting record nearly as pro-prosecution as hers. That may or may not be a good thing. And that's not at all the point here. The only point is that her voting record is very strongly pro-prosecution and, indeed, it is the most strongly pro-prosecution on the court. Moreover, it is not just the strongly pro-defendant voting record of Hurwitz that contrasts sharply with McGregor's record. Take, for example, the voting record of Justice Michael Ryan--the second most pro-prosecution after McGregor's. He took the position more favorable to the prosecution 67% of the time. (He participated in 9 of the total 10 decisions.) But that 67% record reflects the fact that he did side with the pro-defendant position in 3 of the divided decisions in which he participated. More than that, 2 of those 3 (Gant  and Gomez ) were 3-2 decisions. So he cast the deciding pro-defendant vote in those cases. In the third (McKaney v. Foreman ), he disagreed with a pro-prosecution majority opinion and joined Hurwitz's pro-defendant dissent. The contrasts between McGregor's voting record and those of her other colleagues--less pro-prosecution than Ryan--are even greater. More on that and on other voting and decisional matters will be discussed in forthcoming posts. For now, the point here is that the Arizona Supreme Court's record is strongly pro-prosecution, and that of its Chief Justice even more so.